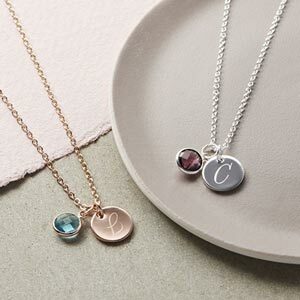 Calantha Stone Heart Silver Personalised Necklaces are beautiful natural stone heart pendants in a lovely selection of colours on a silver or rose gold chain. This beautifully delicate heart shaped necklace comes in a gorgeous selection of shimmering dyed stone colours with lovely freshwater pearl charms in naturally complimentary colours. This pretty necklace is available with a kids or adult length chain. The heart pendant is available in a choice of three colours: pink, turquoise and grey. Also, why not personalise your item with beautiful hand stamped sterling silver letter and number charms, to make your gift that extra bit special. 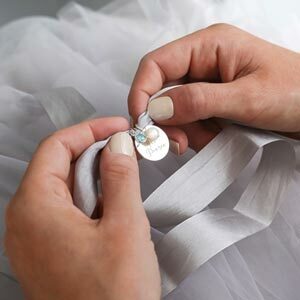 We have embossed charms and hand stamped charms for you to choose from- the hand stamped charms are prepared here in the studio, and the embossed charms have a dark imprint of the letter. Silver plated with a semi precious stone heart and fresh water pearl charms. The personalisation charms are sterling silver. Lovely necklace very personal jewellery and was what i was looking for just the right touch for a birthday present.